IBM® Tivoli® Storage Productivity Center V5.1 products offer storage infrastructure management that helps optimize storage management by centralizing, simplifying, automating, and optimizing storage tasks associated with storage systems, data disaster recovery, storage networks, and capacity management. Tivoli Storage Productivity Center V5.1 is designed to provide device management capabilities, such as automated system discovery, provisioning, data replication, configuration, and performance monitoring for storage systems and storage networks. Tivoli Storage Productivity Center Select Edition V5.1 offers the same features as Tivoli Storage Productivity Center V5.1 but at attractive entry-level pricing for operations with smaller capacities. It is licensed per storage device, such as disk controllers and their respective expansion units. 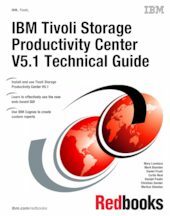 This IBM Redbooks® publication is intended for storage administrators and users who are installing and using the features and functions in IBM Tivoli Storage Productivity Center V5.1. The information in this book can be used to plan for, install, and customize the components of Tivoli Storage Productivity Center in your storage infrastructure.